ANOTHER OF those big days has come and gone. Our pigs have left the farm and unlike last year’s experience which took many frustrating hours to get the pigs into the trailer, this time around it took no more than 20 seconds to have the cargo on board and the doors secured. Undoubtedly, I have learned a great deal from last year’s challenge. With a sense of pride and a bit of a smile on my face, I stood there in the pouring rain, thinking to myself how much of an anti-climax I had just witnessed. So much planning had been put in place with the many potential calamities and obstacles having been considered and after only 20 seconds, we were done dusted and ready to go. That’s progress for you. Now I just need to go and pick our pork up later this week. I recognised very early on in our home-reared meat journey that we have struck very lucky living as close as we do to a great family-owned abattoir and butcher, who takes so much of the stress out of this whole meat-producing lark. For us novices, believe me, that’s a big bonus. After speaking to lots of people in the know, we have also been able to source the right place for us to have some of our pork cured for bacon. That will be another first for us, but I know that Wendy is keen in the future to have a go at curing some pork herself, even if it’s on a very small scale. I’m one of the world’s arachnophobes and on the farm I come across a great many of these hairy-legged critters. But, this last week, I’ve gained an increased respect for them. 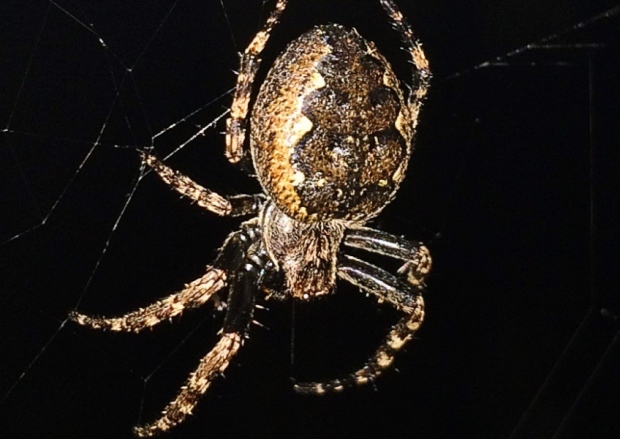 Each night as I go and lock up the animals I come across dozens of ‘Araneus Diadematus’ or garden spiders as they are otherwise known. For someone who has been chased down the street by his mother-in-law with a spider in her hand, it can be quite a challenge in the dark. It appears they have a liking for our fencing and particularly the gateposts. One breezy evening this week as I walked through to say good night to our ‘newbie’ hens I noticed one of our frequent visitors on the hens’ gatepost. I stood for a moment and watched the spider at work, a moment that turned into almost 40 minutes. The spider was in the middle of doing some running repairs on her web. I remember the story of ‘Robert the Bruce’ and the spider, but my goodness here it was for me to observe for myself. The spider was running up and down her web patching it up as she went, securing it all with the new silk she was spinning. Unfortunately though, time and again the breeze would blow and break through the silk as she worked and once again she would have to double back and rebuild those parts once more. Eventually, with the web complete, she settled down for the evening, hoping to goodness, I’m sure, that she wouldn’t have to wait too long for the arrival of her long-awaited supper. Putting aside the fact that this was a hairy little creature which sends shivers down my spine, it was amazing. The lengths she went to and the patience and determination she exuded to keep going until she got the job done was literally a wonder. It has certainly given me food for thought.